Only one team will emerge as a quarterfinalist, still in the running for the championship. Both of these schools are former championship winners. 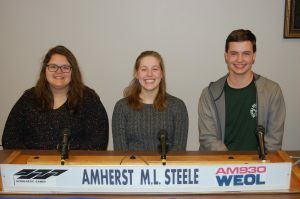 The academic team from Amherst Marion L. Steele High School is represented by, as pictured left to right, Sam Gargasz, Gabby Krugman, and Devin Harmych. 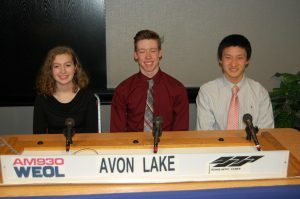 Their opponents from Avon Lake High School are, left to right, Natalie Miller, Connor McNeill, and Irwin Deng. Click above to listen to the program (it is recommended you open it in a new window) or, to find out the final results instantly, go to our official news release.